Pros: Tiny but robust travel scope with great ergonomics that delivers plenty of optical bang for the buck. Super-portable the Endurance delivers a bright, clear, razor sharp image across a wide field of view at 12x, and remains sharp and detailed (though a little darker, as you’d expect with a 50mm objective) right up to a the max zoom of a very useful 36x. Cons: While chromatic aberration (colour fringing) is generally well controlled and certainly isn’t a problem, the slight colour fringing you can see around very high contrast subjects could perhaps have been further minimised if Hawke had chosen ED glass in the Endurance 50’s optical system. Price: RRP GB£329.99 (c.€360) body + 12-36x zoom eyepiece kit (or get it for GB£279.99 on Amazon.co.uk at time of writing). The Endurance 50 spotting scope is a superb little travel scope. When you first see it you wonder how anything so diminutive can possibly deliver on the exacting demands birders and wildlife observers put on their optics. Yet this little Hawke comes through in spades, delivering bright, clear, sharp images and makes carrying a scope viable in situations where you’d never normally think to take one. Paired with a decent compact tripod (I recommend the excellent Vanguard VEO range) it’s a winning lightweight combination that delivers remarkable performance at a very affordable price point. 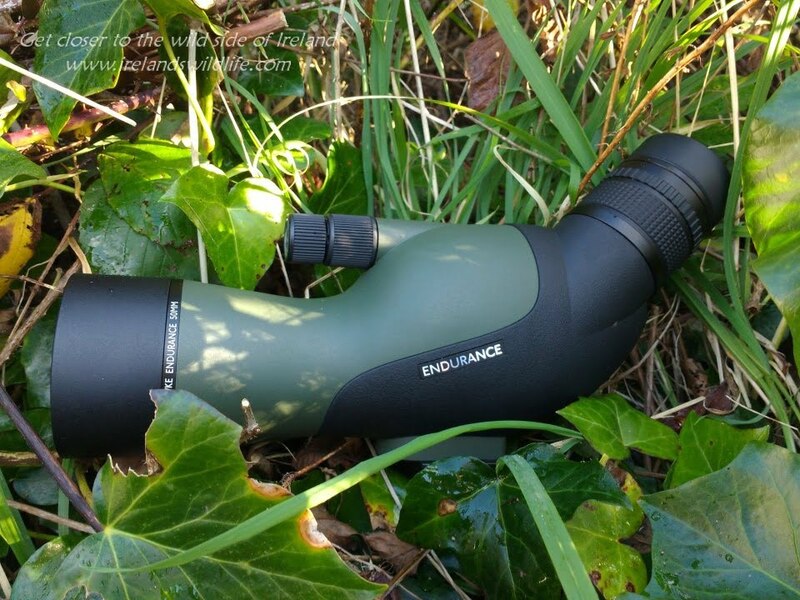 View the Endurance 50 Spotting Scope on the Hawke UK website. 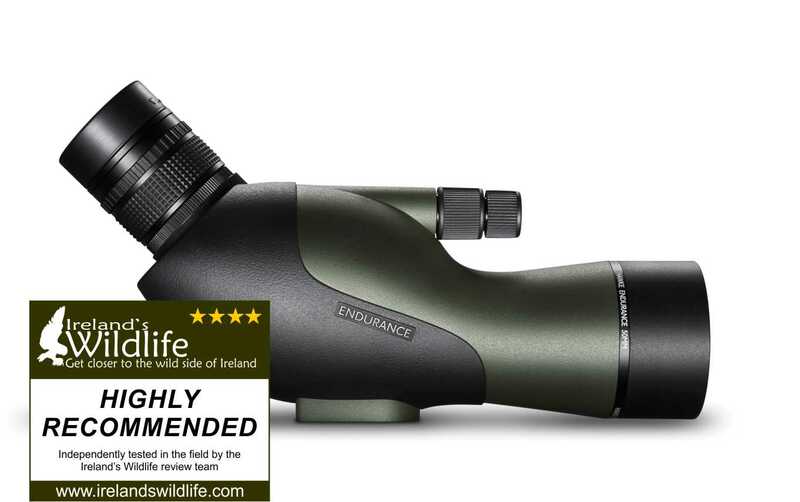 You can buy the Hawke Endurance 50 compact Spotting Scope via the Birdwatch Ireland online shop, Amazon UK or Amazon US. 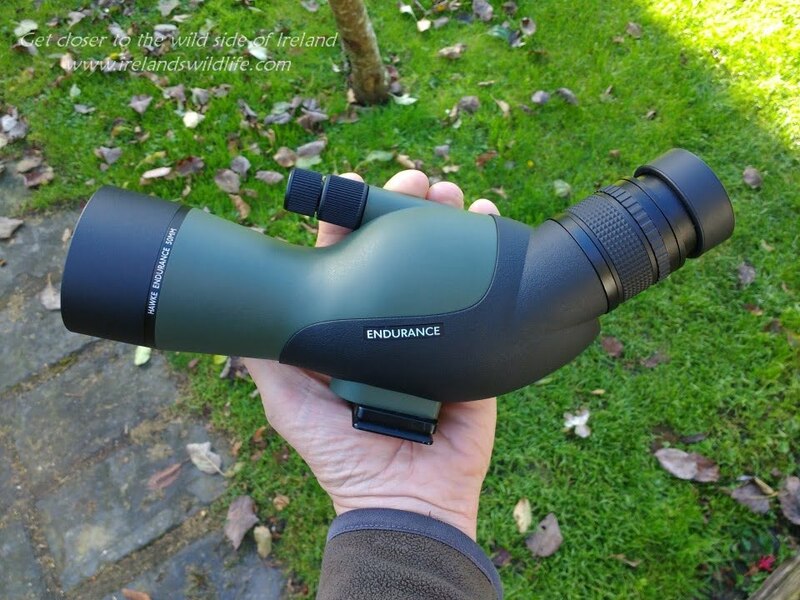 I’ve been very impressed by the quality and performance of Hawke binoculars for the price, so I was quite excited to take a look at one of their spotting scopes. The Endurance family sits in the middle of Hawke’s spotting scope range, and the diminutive Endurance 50 is the company’s smallest scope. It’s aimed squarely at those who prefer to be nimble while out watching wildlife, or as a second scope specifically for travel or for those occasions where you simply couldn’t, or wouldn’t want to cart a full size scope and tripod around. The Hawke Endurance 50 is a tiny spotting scope, and compared to a full size scope it seems to weigh nothing at all. When you first pick it up you wonder how something so dainty can possibly deliver as a practical long-range optic. But this little scope is full of surprises. The Endurance 50’s light weight (official figures put it at just 714g — so lighter than many full-size binoculars) and compact size make it really easy to carry around in the field and stash in a bag. Mine has been living in a compartment in the car for the duration of the review period — which meant I always had a scope handy for those opportunistic wildlife moments. A real boon. The body design is typical of compact scopes, and is essentially a miniaturised version of its larger siblings. Unlike larger scopes the eyepiece is slightly off centre on the Endurance 50 — probably to accommodate the prism into the smaller housing — but otherwise everything is pretty much the same as a standard scope. The design is reminiscent of the legendary Nikon ED50 fieldscope I reviewed some time back — and that’s no bad thing. 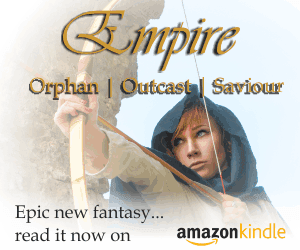 The small size and light weight make it a very easy travelling companion. During the review period the Endurance 50 has been with me on several trips both in Ireland and overseas. It’s been a delight to carry and use. Pop the Endurance ED50 on a compact tripod, or even a monopod if you’re travelling really light, and you have a well balances, functional high performance observation instrument to hand wherever you go. The scope mounts to a tripod, monopod or other support via a standard tripod thread on a flat plate on the scope’s underside. Unlike on most larger angled scopes there’s no rotating collar. On angled scopes it’s sometimes useful to be able to rotate the scope to look through the angled eyepiece from different angles (it’s not an issue on straight bodied scopes). On this smaller bodied scope a collar simply wouldn’t be practical because the location of the mounting plate and the and focus mechanism. The mounting plate itself coated with a textured rubber, helps the scope to “grip” firmly to the quick release plate / head of your chosen tripod. While it is obviously going to be smaller than on a full size scope, proportionally the mounting plate on the Endurance 50 provides a more than adequate surface area to provide excellent support without any risk of slippage. The focus mechanism on the Endurance 50 sports dual focus knobs situated on top of the scope. The nearest (to the viewer) is a coarse focus adjustment geared to move quickly through the full focal range from an advertised close focus of 2.5m out to infinity. The other is for fine focus adjustment that allows you to fine tune perfect focus. Focus knobs are made from ridged hard plastic that provides plenty of purchase, even when wearing gloves, and both controls turn smoothly and precisely. To zoom the scope through the 12-36x range you simply turn the zoom dial situated on the removable screw-thread eyepiece. The fact that the eyepiece is removable suggests that you could use a different eyepiece if you wanted to, although Hawke don’t advertise alternatives for this scope on their site. The zoom ring itself is quite narrow, but turns smoothly and easily, and is ridged to provide plenty of grip to make zooming in and out easy regardless of the weather. As with practically every zoom scope on the market you have to readjust focus slightly when you zoom in or out. The twist-up rubber-coated eye-cup clicks into four positions — fully up, fully down and two positions in between. Hawke specifies an eye relief figure of 16mm. While that’s not the longest eye-relief you’ll find, it should be enough to comfortably afford the full field of view to most glasses wearers, but may be something to bear in mind. Without glasses I normally have the eye-cups on spotting scopes fully extended, but curiously with the Endurance 50 I found the second or third intermediary position provided the most comfortable viewing for me. Unsurprisingly the Hawke Endurance 50 is sealed and fully waterproof. The internal cavity has also been purged with nitrogen to drive out any moisture and prevent the risk of internal fogging when the scope is exposed to sudden changes in temperature. The view through the Endurance 50 is surprising in lots of ways. I was expecting it to be noticeably duller than the view through a normal sized scope with a typical objective lens diameter of 65-80+mm. At 12x the diminutive scope delivers incredibly bright, crisp high-resolution views with superb contrast and vivid yet neutral colours. High quality glass and coatings on the lenses and prisms seem to really pay dividends here. What is even more surprising is how well the Endurance 50 maintains the image when you crank up the zoom. I’m used to seeing marked degradation in image quality as you zoom in with eyepieces in this price range. Not so with the Endurance 50. It continues to deliver bright, razor sharp images through 20x and upwards… at 30x things start to get a little bit darker, but even up at the maximum 36x zoom the image remains pin sharp, contrast and colours remain excellent and the image is more than usable, even on dull days or in lower light. Colour fringing (chromatic aberration) wasn’t an issue in normal use. While I could detect it viewing high-contrast subjects in tricky light, Hawke has done a very good job of controlling at and it’s never really a distraction. I can’t help wondering whether they might have improved things further by incorporating ED glass into the optical design — or at least having an ED option available, as they do with larger scopes in the Endurance family and their Endurance binoculars. 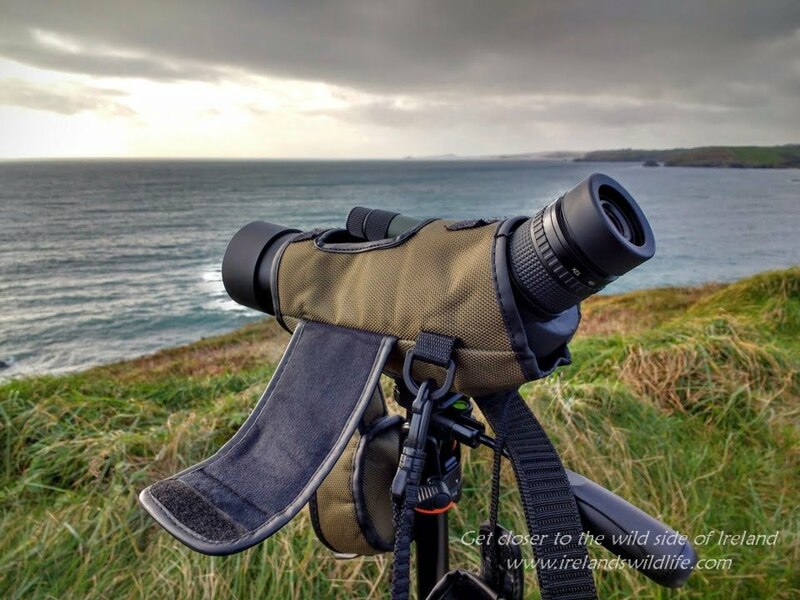 The zoom range from 12-36x sounds a bit on the low side… but in practice it’s a very useful range, taking you beyond the reach of standard binocular and covering the range where most birders and wildlife observers would use their scopes most often — from 20-30x. At 30x the image through the tiny endurance is every bit as good, if not better than many larger scopes in this price range. Another boon of the low magnification, coupled with the excellent close-focus performance is that you can comfortably use this little scope for highly detailed close-up views of things like resting insects or even wildflowers that are just out of reach (the other side of a fence, stream or ditch for example). Obviously a 50mm scope isn’t going to compete with an equivalent spec 65mm, much less an 80mm plus scope in low light — but that’s the compromise you make for portability. Still, the Endurance 50 more than holds its own as light levels drop, and I fount it was much less of a compromise than I was expecting, and one that I’d happily make for lightweight convenience when travelling. Yet another surprise was the field of view through the scope. Often with smaller mid-range scopes you get the feeling you’re looking down a dark tunnel to see a narrow, distant image at the far end. Here again the Endurance 50 delivers above expectations, with a pleasingly wide field of view throughout the zoom range (58m / 1000m at 12x to 30m / 1000m at 36x). One of the beauty’s of the lower magnification with this small scope is a substantially wider than usual field of view compared to higher magnification instruments — making it much easier to pick out what you’re looking for through the scope. There is a degree of image softening at the field periphery, but nothing intrusive, and the large central sweet spot is razor-sharp across most of the field through the entire zoom range. The Endurance 50 is of course fully multi-coated — which means that all glass surfaces within the optical system are coated with multiple layers of high-tech anti-reflection, high transmission coatings. These reduce glare, eliminate stray light within the optical system and maximise light transmission to your eye, resulting in a sharper, brighter image. They certainly do an excellent job here. I was never aware of undue glare (there’s always some glare in some kinds of light with any optic) while using the scope throughout the gamut of light conditions on the Irish Atlantic coast through the rolling countryside of southern France to the midland mountains of Spain. It handled everything I could throw at it with considerable aplomb and performed admirably across pretty much every kind of lighting condition you can imagine. The Endurance 50 was an absolute joy to carry and use in the field. Paired with a lightweight travel tripod you can literally carry it around all day without it becoming cumbersome. It’s ideal if you have a substantial trek to your viewing destination, you want to carry a scope with you “just in case” or when you’re travelling and size and weight are an issue. The “just in case” scenario is an interesting one. I found that because of its tiny size I’d often take the Hawke with me when I wouldn’t normally dream of carrying a scope, and while I’ve been using the Endurance 50 I’ve enjoyed many wildlife encounters that I would otherwise have missed — or at least not seen in as much detail through my ever-present binoculars. The Hawke Endurance 50 comes with the high quality 12-36x wide angle zoom eyepiece, an excellent little stay-on-case that’s one of the most functional I’ve seen on any scope (kudos to Hawke for including this), an eyepiece cap and tethered objective lens cap and a high quality cleaning cloth. Hawke also offer an optional digiscoping adaptor that will work with the Endurance 50. The Hawke Endurance 50 spotting scope is covered by Hawke’s excellent Worldwide Limited Lifetime Warranty (apparently legally limited to 10 years in Europe) that covers defects in materials or workmanship for the lifetime of the original owner. You’ll find more details of the warranty on the Hawke website here. As a keen wildlife observer I always crave the best view possible. That means if I’m specifically going to look at something, if I know the lighting conditions are likely to be challenging, or if I’m guiding a wildlife tour (where showing other people the best possible view is paramount) then I’ll always take my high-end 82mm scope with me. But for casual observation, travel or when carrying a large scope is simply too much effort, then the little Endurance 50 is an excellent choice. 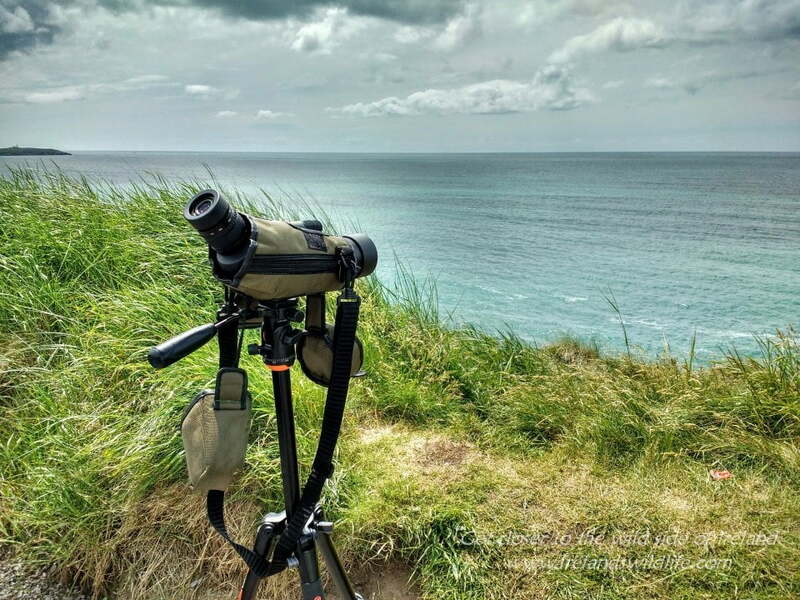 I’ve enjoyed humpback whales and fin whales from the coasts of West Cork, Spanish Imperial Eagles and griffon vultures in the uplands of central Spain, dolphins from the Cliffs of Moher and much, much more through the Endurance 50. It’s a cracking little scope, and offers excellent performance, value and convenience. If you’re looking for a great all-round scope you can take with you anywhere then I’d highly recommend adding this little beauty to your shortlist. 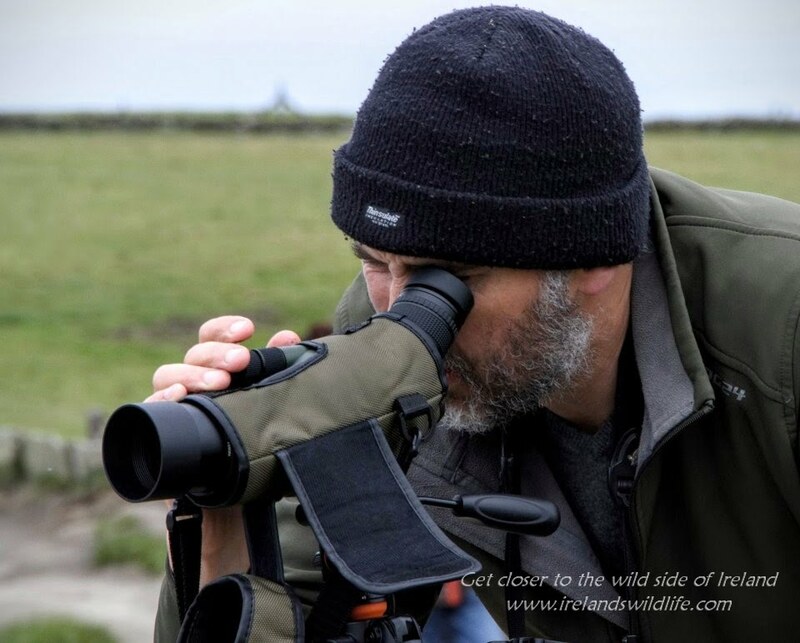 I’d like to thank Hawke for submitting the Endurance 50 12-36x spotting scope for review on Ireland’s Wildlife. Really it’s a great post. Now I use Kowa Prominar ED 66MM ﻿﻿﻿﻿Scope. What is the best spotting scope in 2017.